Hotel was exactly as expected from Marriott chain. Excellent service. Room was well appointed. Location was just as expected. I would certainly recommend this hotel. Staff from valet, check-in to housekeeping were awesome. Valet parking daily fees were a bit steep. A wonderful place to stay. Located in the Gas Lamp district with perfect access to shops and dinning. Everything within the walls of this hotel was top notch! The accommodations were great. Our room was very comfortable. The staff was extremely friendly. In fact I would recommend this hotel to people based on the friendliness of the staff alone. The rooftop bar was cool. The only drawback was that they did not have a pool. The location as also great for exploring the Gaslamp District. I would stay hear again and I would recommend this hotel to friends. Its location was perfect from exploring the Gaslamp District. 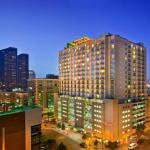 The Marriott San Diego Gaslamp Quarter hotel, adjacent to PETCO Park, is three miles from the San Diego Airport. The hotel is within easy walking distance of the San Diego Convention Center, San Diego Trolley Stop, Seaport Village and Horton Plaza. Coronado Beach, Mission Beach, Baboa Park Golf Course, San Diego Maritime Museum, San Diego Zoo, Balboa Park and Seaworld are a short drive away. Express check-out, video check-out and video review billing services are offered to save precious time of the guests. A full-service business center, concierge desk, restaurant, bar and safe deposit boxes are a big plus. In-room coffee is complimentary. Highlights of suites and guest rooms are flat-screen televisions, large work desks, Gilchrist & Soames spa bath amenities, CD players, contemporary technology, plush bedding and Internet. One-bedroom Coronado, Gaslamp & Park Suites have separate living areas. Travel executives can access wireless high-speed Internet throughout the property. Soleil@k, signature restaurant of Marriott, serves breakfast, lunch and dinner. Altitude Skybar, a rooftop bar, is an ideal place to lounge; and enjoy panoramic views of the skyline, ballpark and the ocean. The access to the onsite modern fitness center is complimentary for visitors. However, there is no Jacuzzi and swimming pool. The seven onsite meeting rooms, covering 8,375 square feet of floor area, are ideal business events. An array of modern comforts awaits you at this elegant property. Most of the guests were happy with everything and would not hesitate in staying here again. They appreciated chic lobby, friendly staff, restaurant, bar, views, comfy beds and spacious well-appointed accommodations. However, some guests disliked expensive parking, poor maid service, dirty glasses and cups, restaurant and uneven floor.